The tale of “Red Dawn” was always nothing but a Reagan era fantasy film to begin with, so the remake of the 1984 action film wasn’t going to be looked upon as anything but fiction pure and simple. It’s a shame that director Dan Bradley’s remake of “Red Dawn” was shelved for a very long time. All things considered, while it does have its inherent flaws, it proves to be much better than the original. The element that Director Bradley improves upon is turning the Wolverines less in to overnight commandoes, and more in to human beings fighting for a cause that may spell doom for them if they’re not careful. And it does this by turning the conflict over on its head and turning the Wolverines in to a terrorist group that is operating underground. Rather than confront the enemy on the battlefield, most of the time their work involves sneaking in and out of occupied territory within enemy lines and planting devices that would rig their efforts to seize their part of the country. The Wolverines become suicide bombers who take risks in planting their own explosives, and this transforms “Red Dawn” from a less teenage take on “Rambo,” and more an espionage thriller. True, the story is absurd, but that just comes with the territory. In their battles against North Korea, writers Ellsworth and Passmore try to give every story element much more of a plausibility, leaving less and less room to roll our eyes at the story. Chris Hemsworth gives a spirited performance as the new Jed Eckert, this time a marine soldier who comes home on leave to visit his family and re-connect with his brother. In the 1984 film, the Wolverines were able to fight against the invading forces because–hey, it’s kind of like football! This time not only do the Wolverines have an actual marine in big brother Jed to lead them in to combat, but Jed is much more of an aggressive alpha male who takes it upon himself to lead his group of Wolverines in to battle and re-condition them in to soldiers. Much of their transformation in to warriors is less centered on “We’re Americans, hell yeah!” and more on “An actual marine is taking charge, we should listen and learn.” And learn they do, as the Wolverines are a much more menacing presence in this remake. Especially in the face of the North Korean and Russian team. They soon become a terrorist organization, and one that doesn’t really take lightly to the invasion. I also appreciate how there’s much more incentive for the Eckert brothers this time around, as the script has scruples to pull off moves that the original film didn’t, including murdering their parents beforehand, allowing them a much more passionate motive to become organized and deadly. Hemsworth and Josh Peck work well off of one another, and Peck adds a more conflicted attitude to the Eckert character this time around. He’s incredibly hell bent on revenge, mucking up the Wolverines goals more times than not, and he grows over the course of the film in fascinating ways. The sad fact is that the characters are still for the most part broad concepts that never really present themselves as anything but action movie archetypes. Even when being depicted as All American boys, the characters are all vaguely written. Especially the female characters, all of whom are less vulnerable and more aggressive soldiers. Which costs them their characterization from the original that made them so interesting. True, this remake is by no means a masterpiece, but manages to tie up the loose ends of the original film and add a more logical touch to it, however thin a layer it may be. In the end, it’s a superior film overall, and I appreciated its entertainment value and alterations. 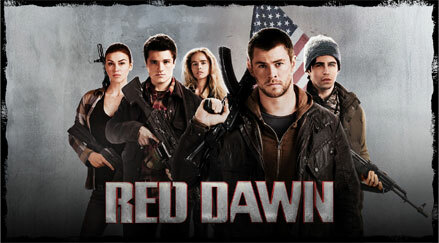 The story is still as absurd and goofy as ever, and the characters are still paper thin, but “Red Dawn” 2012 is a superior film to the original, with great performances, better character motivations, a more focused sense of exposition, and a great sense of action and adventure. This entry was posted in Movie Reviews and tagged Action, Adventure, R, red dawn, Remake, Thriller, War. Bookmark the permalink.